NETL researchers are unleashing the power of microwaves to convert fuels like coal, oil and natural gas into marketable fuels, chemicals and products. In addition to providing higher yields with lower temperatures and less energy, this work is also advancing understanding of the science behind the reactions through state-of-the-art bench-scale facilities with an eye toward scalable and economically viable systems. Researchers are still working out detailed reaction mechanisms, but it appears that a non-thermal effect also factors into the enhanced conversion and selectivity associated with microwave-assisted reactions. Once NETL researchers better understand how microwaves interact with materials, they can design optimal microwave systems for fuel conversion applications. Cutting-edge facilities at NETL are aiding in this development every day. In addition to employing fixed-frequency reactors, the lab has developed a one-of-a-kind variable frequency microwave reactor that can operate from 2 - 8 GHz. “This unit will provide NETL with the most comprehensive look at the electromagnetic characterisation of a wide range of materials for a series of chemical reactions,” said Shekhawat. NETL researchers have already achieved much success using microwaves for fuel conversion processes. A recent paper investigated microwave-assisted pyrolysis, which is a thermochemical pre-treatment step in any coal conversion process that devolatilises coal and reduces its sulfur and heavy tar content. The study looked at the pyrolysis of Mississippi coal and compared it to conventional pyrolysis. Results showed that microwaved pyrolysis of the coal produced higher gas yields at low temperatures, with less tars. Another successful example involves a project with the Advanced Research Projects Agency-Energy (ARPA-E). NETL showed that microwave irradiation could achieve significantly higher ammonia yields at lower temperatures (300°C) and ambient pressures using metallic-supported catalyst systems. Ammonia is an important precursor to a variety of fuels, foods and pharmaceuticals, and developing a more efficient system could save considerable water and energy resources. 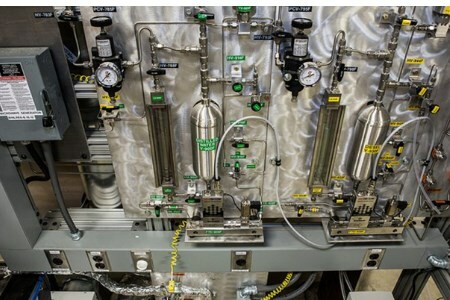 NETL’s work in microwave-assisted conversion science is ongoing, but each new discovery is shedding light on the vast potential of this technology to change how the nation uses its abundant and affordable fossil fuels to produce a wealth of value-added chemicals that will continue to enrich the lives of Americans.